Tulum was everything I wanted it to be and more. In addition to having zero travel issues for the first time in a long time, Tulum had the pristine beaches with crystal clear water – like something straight out of a dream. The week that I spent here, the majority of my time was spent either laying on the beach or frolicking in the waves. I did explore a little bit – only when the beach was too windy. Connected to the public beach is Tulum National Park, which contains ancient Mayan ruins and stories of the once great empire. It was fun to explore and had pretty views…and tons of iguanas! One of the highlights of my time in Tulum was a day trip to Sian Ka’an Natural Reserve. Only about 8km outside of Tulum, Sian Ka’an is seeping with wildlife, and is home to the second-largest coral reef in the world. We saw alligators, sea turtles, iguanas, and manatees, in addition to the thousands and thousands of birds. Osprey, pelicans, roseate spoonbills, great blue heron, ibis, and so many others. I began to see why people get into birding – that was really cool! After checking out the birds in the lagoon, we had lunch and headed out to the Caribbean for some top-notch snorkeling. Fun fact of the day: coconut trees aren’t native to the Caribbean – they’re actually an invasive species! Who knew!?! The excursions were cool, but I mostly enjoyed hanging around town. My comfortable routine of eating breakfast at the hotel, taking 20 minutes to apply sunscreen to my own back (Do you know how hard this is?) and biking to the beach was the epitome of relaxation. When I got hungry, I would bike into town. My goal was to try a new place each day…but I ended up finding a little French bistro that I adored. The owners are delightful Belgian couple that kept me supplied in delicious food and the smoothest tequila I’ve ever tasted. The tequila comes from their friend’s basement across the street, though, so unfortunately there won’t be any coming home. You guys will just have to take my word for it. After lunch I’d typically head back to the beach until I was hungry for dinner, when I’d bike back into town. I did manage to try a new dinner place every night – no repeats. The first night, I almost ended up in tears after dousing my taco with a salsa that was wayyyy hotter than expected. But I got it together just in time and only ended up with some hiccups. On the next night, I learned that Tulum loves happy hour – for the first (but not the last) time, I ordered a margarita only to find out that they were on special: two for one! Gotta love vacation! It was on the bike rides home after dinner that I discovered the truly horrifying part of the city: how many spiders were lying, waiting, all around me. My headlamp was reflected off of each set of eyes, like a small piece of glitter lying in the grass. It looked like someone had just cracked open a piñata over top of the bike path – glitter everywhere. I stayed safely on my bike until reaching the hotel. Perspective is a tricky thing. It can make or break a situation. A good sense of perspective can help avoid arguments and provide compassion and empathy in difficult times. And gaining a sense of perspective is one of my favorite side-effects of traveling and living in other cultures. It’s easy to get caught up in the rote, minutia of day-to-day life. It’s easy to forget how lucky most of us are. If you’re reading this, it means you have access to a computer and internet. It means you have the time to find and read my quirky, little blog (which I obviously really appreciate!) and these two aspects, along with many other likely characteristics probably put you in a category better-off than many people around the world. This makes you lucky – it makes us lucky. The other day, while picking salmon berries along the side of the road and watching eagles soar overhead in the sunshine, a friend said “We’re so lucky to live here,” which made me think about perspective. And, she is completely right. This town is so weird but oh so great. Cordova is a very small town. It’s basically divided into 4 areas, geographically. You have “town,” which is about 2 city blocks and you have the harbor, where all of the boats are parked. There is one main road that goes through town. Leaving town and going west will take you to a hotel called Orca Lodge, where the road dead-ends after about 3 miles. Going anywhere in this direction is called going “out Orca.” Leaving town and going east, towards the main airport is called going “Out the Road.” The road passes Eyak lake, winds along the Copper River and passes the main airport, but mostly it is surrounded by wide-open expanses of land lined with snow-capped mountains. It dead-ends where the bridge which used to connect Cordova to the rest of the world was washed away years ago, about 30 miles out of town. I love going Out the Road. There’s the Copper River in all of its glory, there’s Sheridan Glacier (among others), There’s countless well-maintained hiking trails and endless wilderness to explore off the trail. There’s moose. There’s bears. There’s delicious berries. There’s fishing, kayaking, climbing, swimming, boating, and pretty much whatever else you feel like doing. It’s paradise. Running out the road is where I run to train for my half marathon. It’s where I ride my bike when I want to explore something new. It’s where people go to have a bonfire, celebrate holidays, picnic, and relax. And virtually all of the land around here is nationally protected, so it is acceptable to set up a little camp and hang out wherever you please. And, any time I get to say I “went Out the Road” I feel like a local using insider lingo. It makes me smile. It’s easy to take Cordova for granted. It’s easy to feel stuck; without a road connecting you to the real world it can seem isolated. Mail takes forever to arrive, everything is expensive, and Grub Hub or Uber certainly don’t exist. Sometimes it feels a little like living abroad – for example, one half-mile stretch of road has been torn up and “under construction” for over a month because someone decided to repave the road without knowing that there is a national asphalt shortage. Really? A national asphalt shortage?? In the US? Ha. But it is totally worth it. It’s easy to get wrapped up in these details and forget what Cordova is – a paradise of naturaleza. Alaska is pretty disconnected from the rest of the lower 48 states. In fact, I see more similarities on a daily basis that resemble life in a different country than I see connecting it to my own. If it weren’t for the fact that I still have cell phone service, I might forget all together. The sheer size, the new culture and the contrast in climate make it completely different than anywhere else I’ve ever lived before. There are also some completely different norms here, which only add to the feeling of living abroad. Here are five ways that Alaskans seem to have life figured out just a little better than their neighbors to the south (and elsewhere). It’s a big state. And in most places (cough cough…Cordova) there is limited access to pretty much everything. Thank god for Amazon Prime…but that’s a different story. Most things here – if they’re available – are pretty expensive because they’re imported. It’s almost like living on an island. So in Cordova, for example, most people do all of their serious shopping (groceries, clothes, etc.) in Anchorage. To accommodate, Alaska Airlines gives all passengers traveling within the state 3 FREE checked bags on every flight. So a family of four going on vacation to Juno would get to take 12 bags with them. Or, a mother taking her son to Anchorage for his monthly orthodontist appointment can bring back 6 suitcases-worth of shopping. And by suitcases…I mean Rubbermaid totes wrapped in duct tape. Sitting at the Anchorage airport for an extended period of time means that you see lots of people rearranging their groceries to stay under the 50 lb limit – heads of cabbage and bags of oranges are flying everywhere. Alright…so this is a little less of a life hack and a little more of me being extra-appreciative of the fresh air after spending the past 7 months in India. But Alaskans sure do know how to have some gorgeous cities with fresh air. And in the past week, I don’t think I’ve heard a horn honk…even once. I loved India, but this is just so nice. Okay, okay…I’m done. When I found out that my house would be a cabin…I had visions in my head of a quaint, little cabin where I could finally have the space to make a little garden. Fresh tomatoes, basil, lettuce, you name it. I even arrived in the beginning of spring – perfect timing! As usual…nothing ever turns out quite as expected. The soil in these parts is terrible – nothing can really grow without a greenhouse and a person with an extra-green thumb. I have no greenhouse…and my thumb is basically black…so I guess there won’t be a garden. Bring on the Vitamin D. Today, April 5th, the sun will set at 8:39pm and will rise tomorrow at 6:39am. Right now, Southern Alaska is gaining about 45 minutes of daylight per week. It won’t be very long until the Midnight Sun makes an appearance. There aren’t many other places around the world where someone can work all day and then climb a mountain, ride down the Copper River or hike up a glacier afterwards. It’s a shame the soil is so poor in Cordova, because in other parts of Alaska vegetables are enormous due to all of the extra photosynthesizing going on. Winter is pretty brutal in Alaska, (Or so I’m told – I’m not quite brave enough to fact-check this one myself.) so many business are only open half the year. Fishermen and hunters have a very limited season, some of them earning their annual wages in just a few days. As long as I don’t have to spend my winters off here in Cordova…this seems like a pretty sweet set-up – work six months in Alaska, and go migrate somewhere warmer once the temperature drops. Normally when I travel for work, I like to fly in a little earlier or fly out a little later, allowing myself to travel and explore. Arriving here before April, though, or leaving after October 1 just don’t sound that appealing to me, though. We’ll see. Know of other cool tips and tricks that are unique to Alaska? Let me know! I’ve been primarily offline the past few weeks – I came back to the US in mid-March and spent a very nice two weeks at home enjoying some quality time with my favorite people, consisting mostly of endless Easter egg hunts, Legos and delicious food. Now, after what felt like a never-ending string of flights, I’ve finally landed in my home for the next six months: Alaska. Though it took almost as long to fly to my little ocean-side Alaskan town as it did to get all the way to Bangalore, it was so much more pleasant. Even as I am writing this, sitting in Anchorage airport, the check-in assistants are singing songs to passengers and I’ve seen at least five frequent fliers come in and greet the attendants by name and get received with a big hug. It’s not in an obnoxious way, either…just sweet. Everyone is so friendly! I really loved India, but it was definitely time for me to take a break and try something new – and I think Alaska will be just the thing. As usual…I’ve done my research and I’ve come up with my Alaskan bucket list to complete over the course of the next 6 months. Other than eating as much seafood as possible, soaking up fresh air and enjoying the wildlife…there are a few things I don’t want to miss out on. Drunken Moose – This one might not be possible since I’m coming in the summer…I might have to settle for seeing a sober one instead. I listened to a podcast recently which described how moose end up eating rotting crab apples to make it through the winter in cities around Alaska. The fermenting fruit has an intoxicating effect, meaning cities sometimes have 1,400 lb drunken beasts roaming the streets. I think the winter has been fairly mild, however, and it’s already April. I’m betting that the foliage that is already available is much more appealing than fermenting apples…but I’ll still be on the lookout. Glaciers – There are few other reasons to venture out to the freezing tundras…but seeing some stunning glaciers which aren’t likely to be around for much longer is definitely one of them. You will find me riding a dogsled pulled by some adorable huskies and kayaking through glacier rivers…among whatever other activities intrigue me as well. Climb Denali – Denali, the tallest peak in North America, is obviously on the list…as long as my knees cooperate. This year marks the 100-year anniversary of the US National Parks, so it seems only fitting to spend some time in Denali National Park and summit the 20,310 foot peak. Guess I better order those glucosamine chrondroitin supplements now! Northern Lights – no Alaskan bucket list could be complete without seeing the Northern Lights! The strength of the lights depends on the year and the lights peak every 11 years. The last peak was in 2013…but there should still be plenty of solar storms and sunspots to fill the sky with colors and keep me entertained regardless! Fly in a Float Plane – These are the small planes that fly low to the ground for amazing sight-seeing and can also land on water. They provide a totally different view of the wildlife and can land on the WATER! Sounds like something I need to do. Know of other things I should try? Let me know! Last week marked the beginning of a 10 day Hindu festival in India called Dasara (or Navaratri, depending on where you live). There are a few different stories about how the festival came to be, but mostly it signifies the triumph of good over evil. I’m into that! 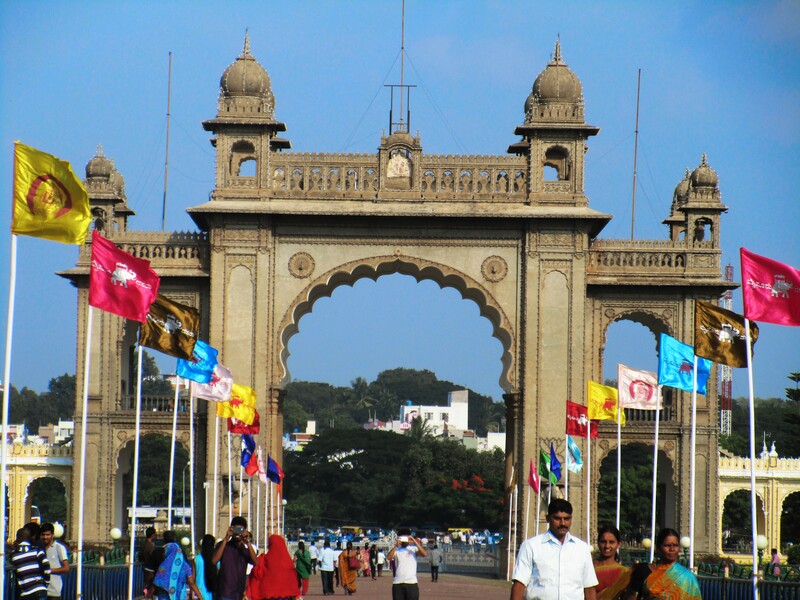 The biggest celebrations happen in a city called Mysore, which is about 3-4 hours west of Bangalore. 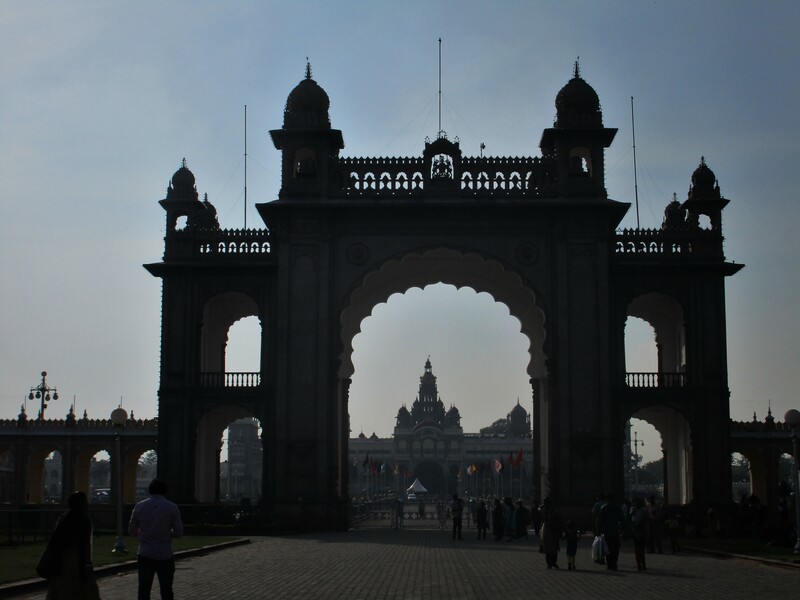 I hadn’t yet been to Mysore, so I decided that Sunday would be a good day to make the trip and I convinced my roommate and some friends to come along. We planned to go by bus, but my roommate immediately said he would find us a car. Seemed good to me. (Note: This was a mistake. Lesson learned.) 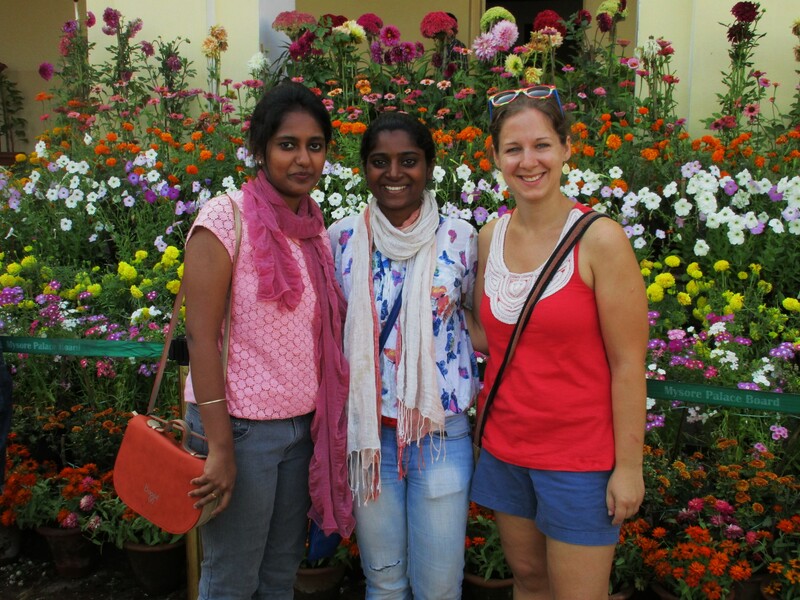 We set off around 8:30 – a little later than anticipated…but it was India time. After stopping to fill up the petrol, it seemed that the petrol tank was leaking…a lot. We pulled over and the guys who were driving went off in search of a mechanic. While they searched, we ate breakfast, and were quickly told that there wasn’t actually a leak. The man at the petrol pump had just overfilled the tank. So off we went. I thought a car would be faster than a bus, but nothing moves fast in India. We stopped for someone to talk on the phone (because obviously he couldn’t sit in the passenger seat and talk at the same time) then someone wanted to stop at a temple, then someone wanted a snack, then a drink, then they thought the car needed to cool down and take a break (ummm…). It was 11:30 and we were barely half way. 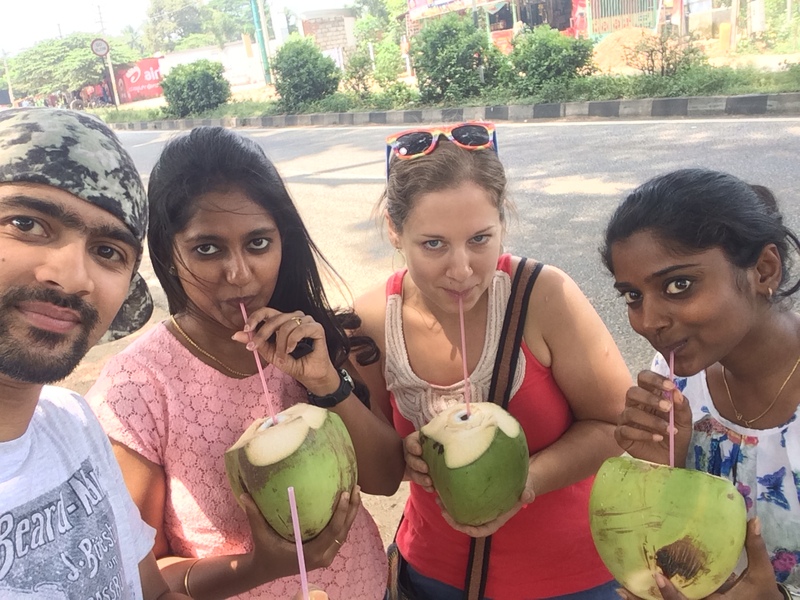 Trying to remember that we were operating on India time, I chatted with my friends, enjoyed the scenery and drank my coconut full of coconut water. After a few more stops, we were finally about 20km away from Mysore when the driver slowed down and the car started to make slight jerking motions. The driver insisted it was probably fine. Then the car died, because obviously it wasn’t fine. The driver and his friend went off once again in search of a mechanic, and my friends and I decided we should hop on one of the many buses passing by in the hopes we would actually get to Mysore. 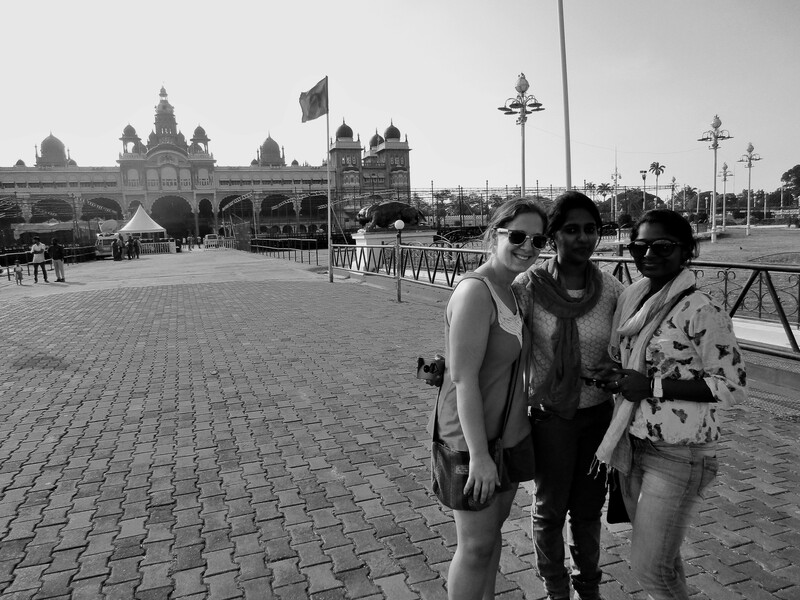 Thirty minutes later around 2:30, we were dropped off right in front of the Mysore Palace. 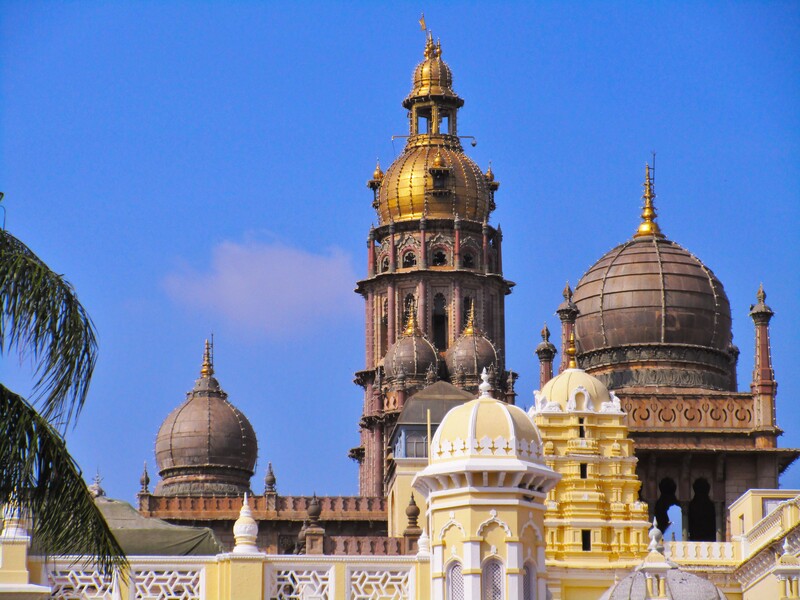 Parts of the palace date back to the 14th century and it was home to many rulers, including Tipu Sultan. 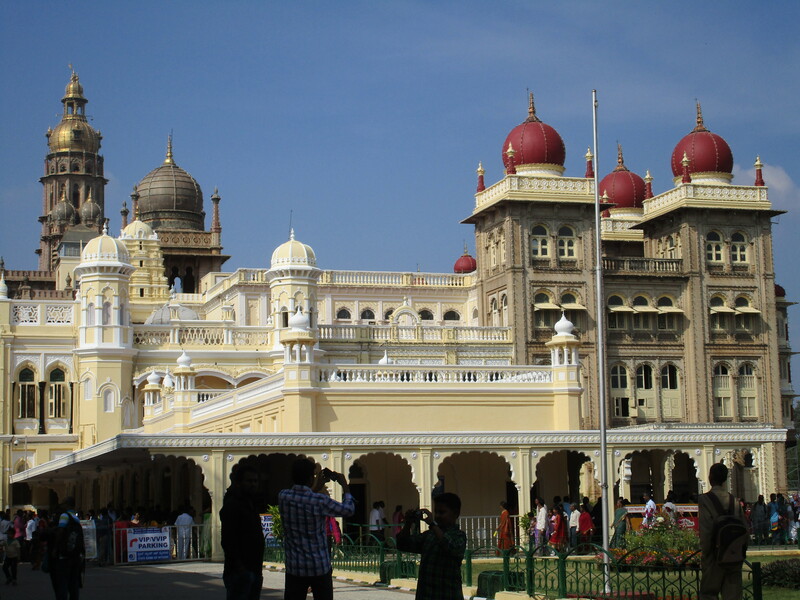 The palace is also the focal point of festivities for Dasara. The palace is gorgeous and the architecture is amazing. You technically aren’t allowed to take pictures inside…but I managed to sneak a few. If the guards see you, they blow their whistle as loud as they can and come rushing over to make you delete them. The palace was quite crowded, and the guards were actually pretty comical. 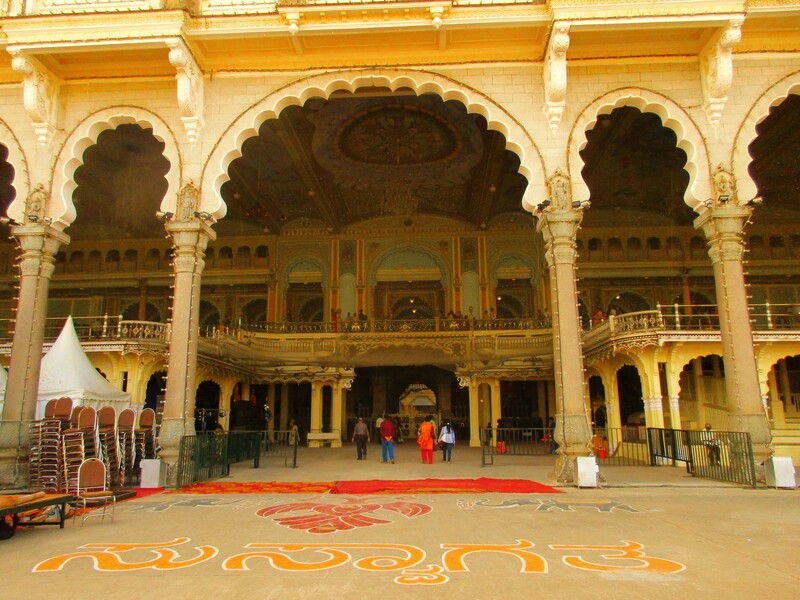 After the Gaudi house in Barcelona, the inside of the Mysore Palace might be my favorite architecture. Below are some of the photos I managed to get. 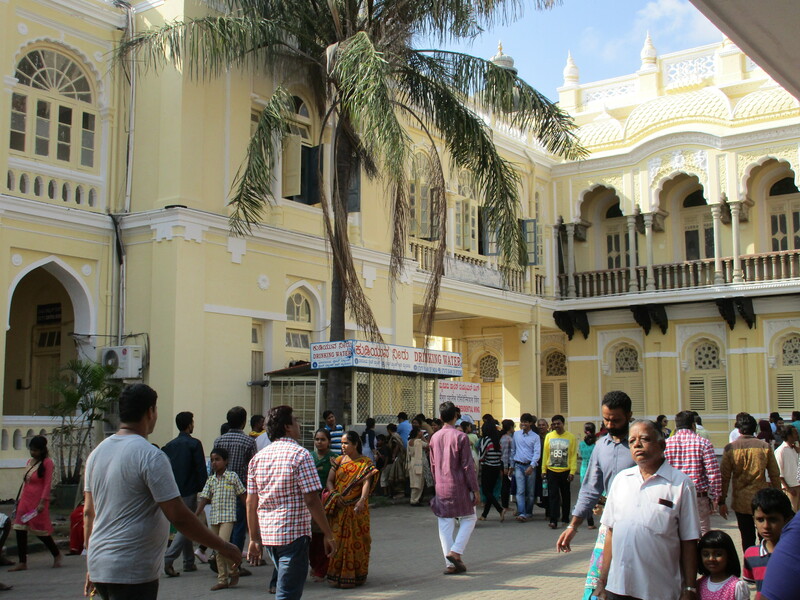 This is a large hall on the ground floor used for making speeches and presentations. 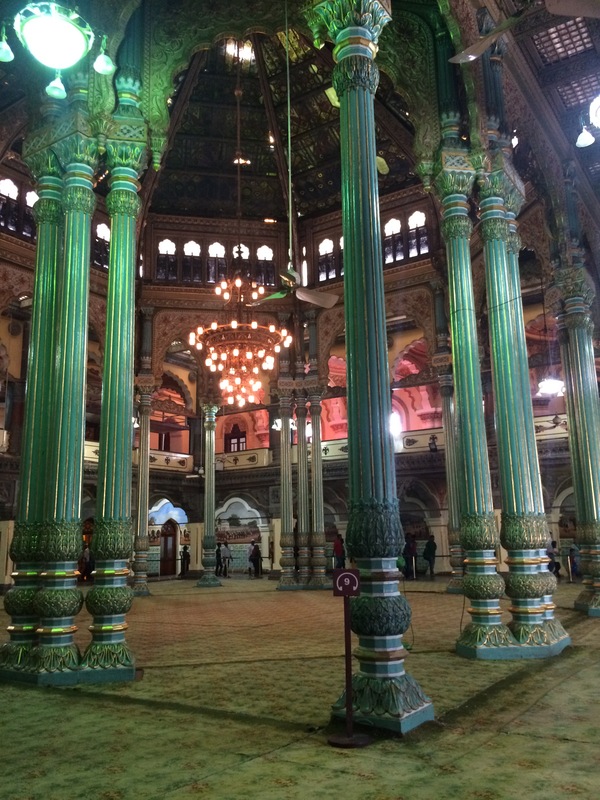 Notice the intricate hand-carved columns. This is one of my top five favorite photos I’ve ever taken. I just love it. This is a courtyard in the center of the palace. We walked around, took some pictures, checked out the elephants getting ready for the parade that night, then we headed off to grab some food and meet back up with our drivers -it was already time to begin the journey back. 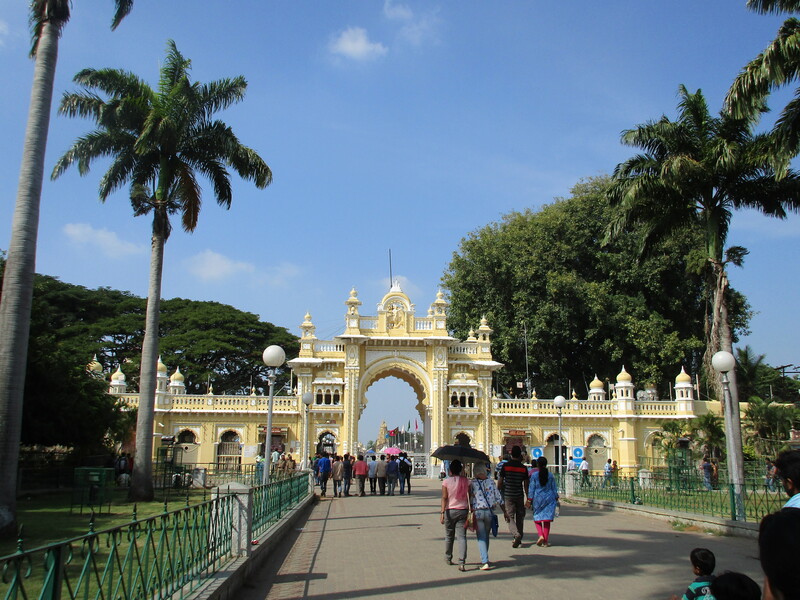 The driver and his friend, however, said they were now tired of driving, wanted to go visit some waterfalls about an hour away and stay in Mysore for the night. So, they dropped us off at the bus station and back we went. Lesson learned – stick with the bus. No more friend of a friend drivers for me. 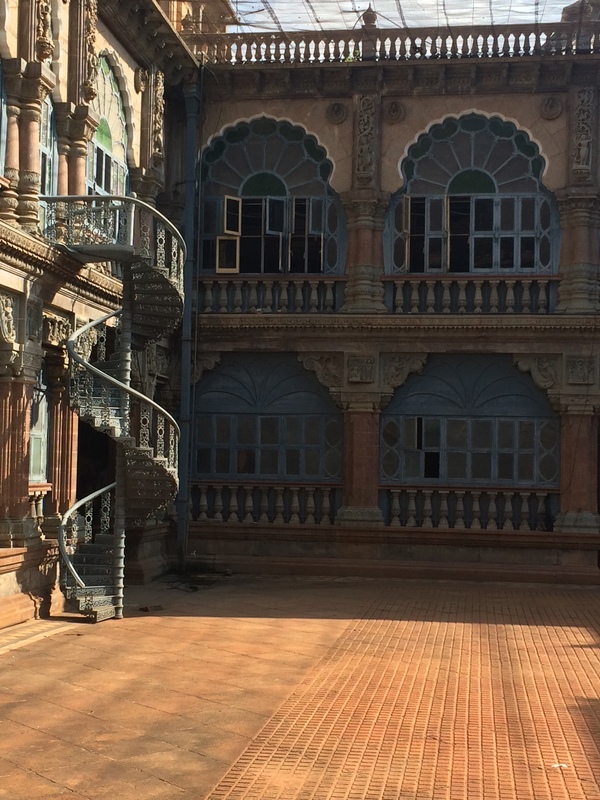 Overall it was a success – it was adventure and the palace was beautiful. 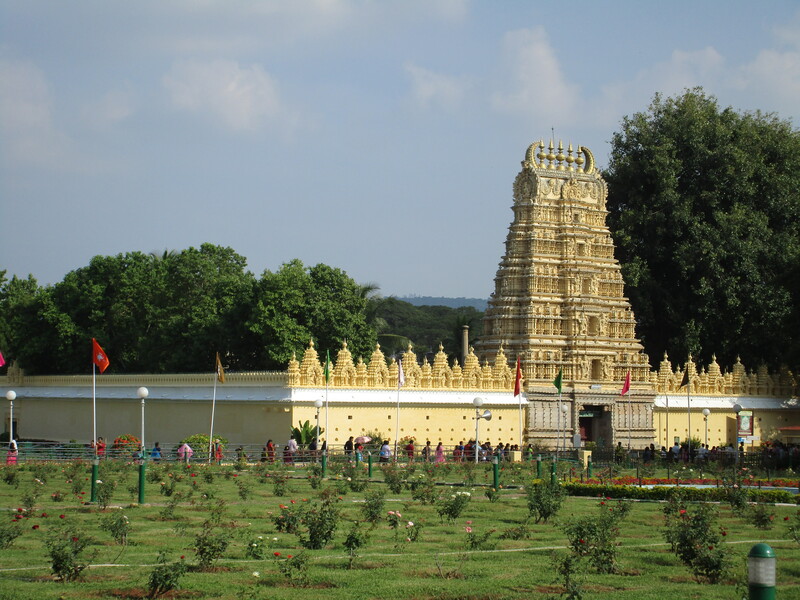 I guess I just need to go back to Mysore. And I am working on adjusting to Indian time…Sunday was one more test to get me there. Taking a post-bath drink! Notice his tusks have been removed to protect him from poachers.